Former 100 metre record holder Asafa Powell has been handed an 18-month ban for failing a drugs test at last year’s national championships. The suspension has been backdated and will end on 20th December 2014. As the once Jamaican golden boy ages and his performances drop one has to question whether it was simply a matter of time before something of this nature was to happen. 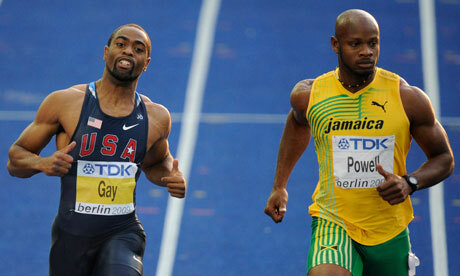 The 31 year old sprinter isn’t another in the sport’s long and dark love affair with steroids in fact the drug Powell has been reprimanded for is the banned stimulant Oxilofrine. For those of you that have no clue as to what Oxilofrine, or Methylsynephrine, is (I don’t blame you I’d never heard of it either) the drug commonly used to treat low blood pressure. You may be asking what does this have to do with sprinting and why is this bad? Well an effect of this drug is a spike in the production of adrenaline. With an increased level of adrenaline comes more exercise endurance, level of concentration, better blood flow and a higher level of alertness. Now you can see why this would benefit an athlete, with more exercise endurance it is possible to push the body harder mix this with more oxygen flowing to the muscles from an increase in blood flow meaning higher muscle efficiency and finally add this with more alertness meaning faster reactions to a start gun, for example, and you can see how the stimulant can give a person the upper hand and is rightly banned. Powell is not the only sprinter as of late to be banned for the use of Oxilofrine, fellow country women Sherone Simpson, a silver medallist in the 100 metre and 4×100 metre’s at the 2012 London Olympics has also recently received a ban for the drug. More than this the drug appears to be being used in other countries also, Tyson Gay the second fastest man in history with a 100 metre record of 9.69 seconds, second only to the living legend Usain Bolt’s 9.58 second race that appears to have bent the laws of physics and what a human being is capable of. As is so often the case Powell is attempting to plead ignorance blaming his physical trainer, Canadian born, Chris Xuereb who according to Powell provided him with 9 different supplements one of which being Oxilofrine. This may be the case. Maybe Xuereb is behind the ban and Powell was unaware but as a fellow sprinter Kim Collins said to BBC on the incident “you cannot put the blame on anybody else by saying, ‘I trusted people.” Even if it was the trainer administering the drug Powell must be punished for this, the world of athletics, sprinting in particular, is rife with drug cheats smearing the profession and it would be wrong to allow a competitor the benefit of the doubt because he apparently had no idea. Powell would not be the first athlete to turn to illegal measures as he grows older and past his prime while younger models excel and after the heartache of his DNF at the 2012 100 metre Olympic final due to a pulled hamstring it wouldn’t be too surprising that the former great felt compelled to try anything to regain the form of his youth. Another possible reason for athletes using drugs in the sport as of late, Tyson Gay in particular, is because the simply cannot cope with the pace of the greatest sprinter to ever live Usain Bolt. We are blessed to be alive in a time in which an individual possesses so much raw talent and skill in an area, Usain Bolt truly is a once in a lifetime phenomenon. While as a spectator it is incredible to see a man destroy the world record as comfortably as he did at the World Championships 2009 in Berlin and who can forget the final in the Beijing 2008 Olympics where he broke the current world record by jogging the final 20 metres take a moment to think about his competitors and how they feel. Imagine being Tyson Gay and running that 9.69 100 metres, the best race of your career and knowing that there is a man a few metres quicker. With this in mind and the ferociously competitive fire that burns deep in all athletes one can begin to see why competitors may turn to banned substances purely to keep up with Bolt. let it be known that in no way am I condoning the use of drugs in sport although sad on a personal level to see top class athlete’s banned I am pleased to see that Anti-Doping Agencies are picking up on such things and taking action hopefully deterring the use of it in future athletes (Unlikely) I am simply say that I can understand why some may feel the need to take these drastic measures. Finally, many cynics constantly state that Bolt himself is on some form on performance enhancer, me I’d like to believe that he truly is the best we have ever seen. His rise to the top of the sprinting world appears to be very much organic as his have times progressively quickened at a steady rate from that of a junior to the mega star that announced himself to the general public in Beijing 2008. At no point in Bolt’s career has there been a spike is race times that would suggest some form of performance enhance, he just is that good. Can Bolt be beaten? Yes, yes he can. Tyson Gay has beaten Bolt a few times, although unfortunately for me this is rather tarnished in light of current events even if the races were some time ago, also it has been well documented that Bolt’s training partner Yohan Blake, The Beast, has between Bolt before and in my opinion Blake will be the man to beat at the next Olympics in 2016. This being sad I predict that Bolt’s World Record will stand for a considerable amount of time as out of the current crop of World Class sprinters he is the only one with the ability to go faster. As Bolt continues to dominant the sport do not be surprised if more top class sprinters fall foul of the temptations of doping resulting in similar fates to that of Powell and Gay. Here is the moment Bolt broke his own record and ran that unbelievable 9.58 second 100 metre race. This Post was posted in Athletics and tagged 100 metres, Blake, Bolt, Doping, Drugs, Gay, Powell, Simpson, Sprinting. Bookmark the permalink.